AIM completely overhauls the vanilla World Selection Screen! 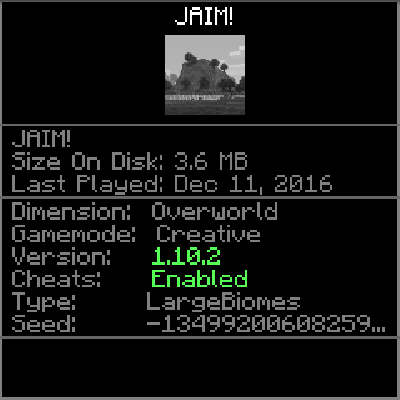 The JAIM World Selection Screen™ shows the player more information about their world, such as how big it is, when it was last played, what dimension the player is in when the world was saved and much more! With JAIM it will be easier for a player to get information about their worlds without having to join it! 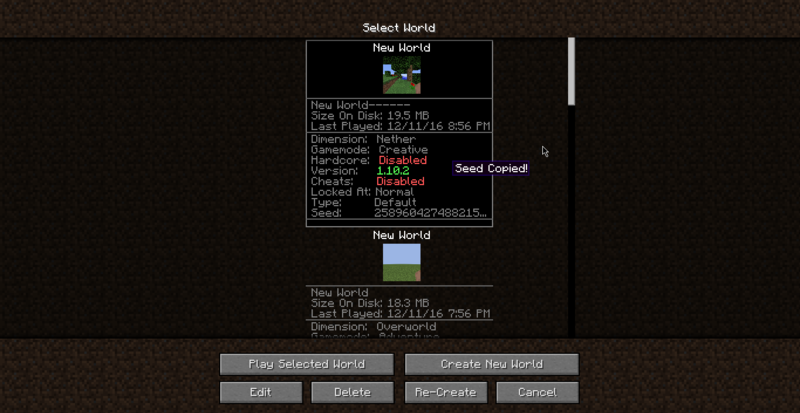 For example, when a player ctrl+clicks on a world, the world seed will be copied to their keyboard! Planning to port this to new version of MC? are you have plan to update this mod to mc 1.12? You got an issue tracker? I'm getting some pretty bad UI lag on the world select screen. Cool! Will it be ported to any other versions, or are you going to stay on 1.10.2?